Our objective as investors in the fund is to achieve a high return on investment in the long term minimizing the risk of permanent loss of capital in each of our investments. Permanent capital losses mainly arise from excessive leverage, poor long term business performance or overvaluation, so we conduct our analysis with a special emphasis on these three aspects; valuation, financial structure and business resilience. 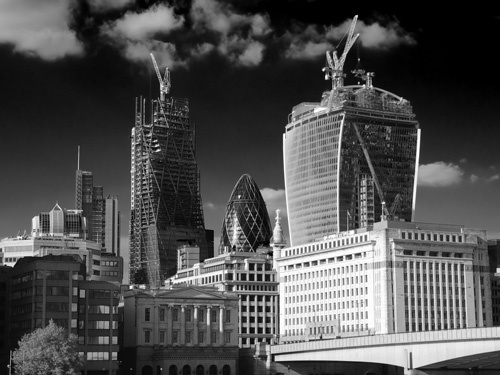 We consistently scan the market to find companies that can be bought at a significant discount to our estimate of intrinsic value and at the same time have a robust business and a reasonable financial structure. Equam Capital’s partners have invested their net worth ensuring a complete alignment of interests between investors and the advisers. Our partners have a sound business experience, gained both from professional experience in investing and from successful private equity investments. Our approach to the selection of listed investments is similar to that of a private investor; we try to understand the competitive advantages of the business, its future prospects and potential threats and calculate its intrinsic value before we invest. We assess macroeconomic conditions to the extent that they can affect the businesses in which we invest, but we do not try to anticipate market movements. We invest with a target time horizon of five years, trying to take advantage of the short term price volatility to build long term investment positions. Whereas many academics and investment professionals measure the risk of an investment as its short term price volatility, as investors we see risk as a high probability of permanent loss of capital in an investment, derived either from paying too high a price or from buying overleveraged or declining businesses. Our portfolios are constructed with high conviction ideas, while diversifying the different sources of value and catalysts to our portfolio. We invest in situations where market prices offer a wide margin of safety, which we measure as the difference between market price and our estimate of intrinsic value. This approach notably reduces the risk of permanent losses, while facilitating the achievement of reasonable returns over the full investment cycle. In addition to quantifying intrinsic value, we assess and quantify the impact of bear scenarios on the intrinsic value. 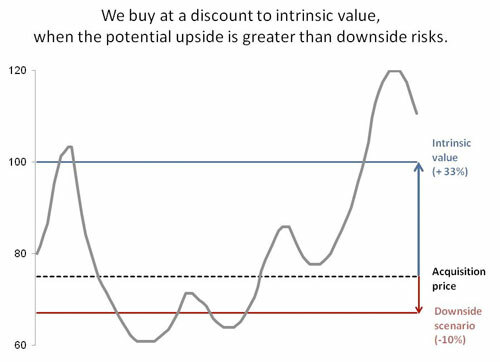 We look for assymetric situations where the trading Price not only offers a deep discount to its intrinsic value, but also little downside relative to the bear scenario price.